In Armenia, representatives of the government circles welcomed the results of the meeting as a diplomatic victory, stating that it was possible to bring the agenda of the meeting to strengthening the ceasefire regime and even to agree on the implementation of OSCE monitoring mechanisms. In other words, the Armenian side’s conditions have been met. The Azerbaijani side claims that there were no specific agreements reached during the meeting. According to official reports, perhaps the only specifically agreed item concerned the expansion of the existing Office of the Personal Representative of the OSCE Chairperson in Office. As for mechanisms of investigation, it was not said during the meeting when and who will deliver that. During the Vienna meeting it was also registered that the strengthening of the ceasefire regime may allow the sides to return in June to negotiations on a framework resolution of the Karabakh problem. In Armenia, a natural question has arisen in Yerevan – have the conditions of the Armenian side at the negotiations changed and what should be expected from the meeting in June? According to experts, there are still only the Madrid principles (or their Kazan variation) on the negotiating table today. These principles imply painful territorial concessions from the Armenian side and a change of the status quo that many in Yerevan and Stepanakert believe will not be in favor of Karabakh. 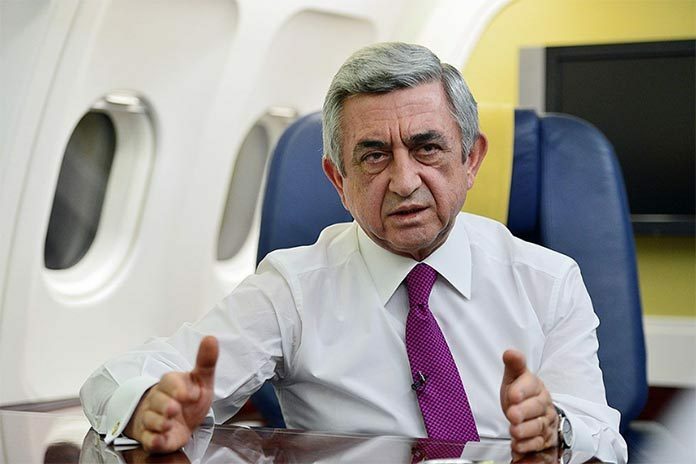 In an interview with Armenian journalists on board his presidential jet whiling returning to Yerevan from Vienna, President Sargsyan said that “our goal is not to preserve the status quo and have an endless war”. He said that Armenians lost only some 800 hectares of land in the April 2-5 hostilities in Karabakh, while the total security zone held by Karabakh forces is 800,000 hectares. Hardliners in Yerevan and Stepanakert criticized Sargsyan for the reference, in particular for calling territories that are part of the Nagorno-Karabakh Republic under its constitution a “security zone”, in other words, making them subject to negotiation. Hardliners in Armenian are concerned that the Armenian side may concede at negotiations what Azerbaijan could not take by force last month. And this may happen if Armenian diplomacy returns to negotiations about the change of the status quo. In Azerbaijan diplomats and officials already talk about a phased settlement, noting that the Armenian side has finally agreed to it. A “phased” settlement implies the withdrawal of Armenian forces from the bulk of the current Karabakh territories, introduction of peacekeepers and conduct of a referendum on the status of the former Nagorno-Karabakh Autonomous Region (NKAR) at a future date. NKAR’s area in 1988 was 4,300 square kilometers. Now, NKR’s area is 12,200 square kilometers. Armenian Foreign Minister Edward Nalbandian, in fact, confirmed this, saying that Armenia is for the “package option”, but with “phased implementation”. But in practice it means precisely a phased version. In his interview Sargsyan did not say a word about conditions of settlement of the conflict, a phased option and territorial concessions. He spoke about respecting truce and the need to avoid a war and losses. Analysts say that in the next two years of Sargsyan’s presidency, he will try to avoid political decisions, insisting on compliance with the truce and strengthening of the OSCE mission monitoring in the Karabakh conflict zone. However, the question is whether global developments make it possible to delay the signing of a political agreement, which may be taken as defeatist in Armenia. And will Azerbaijan allow that, since it keeps threatening to resolve the conflict by force? During the night when Sargsyan and Aliyev were discussing peace in Vienna, skirmishes took place in the conflict zone – Karabakh and Azerbaijan reported one casualty each.